Build upper body and core strength, increase flexibility and improve your posture and balance with our Trapeze classes. Supported inversions create traction in your spine to help release tension in your back. Expect to work while having fun in this class! Unsure if you can practice Trapeze? Please ask the teacher for advice. 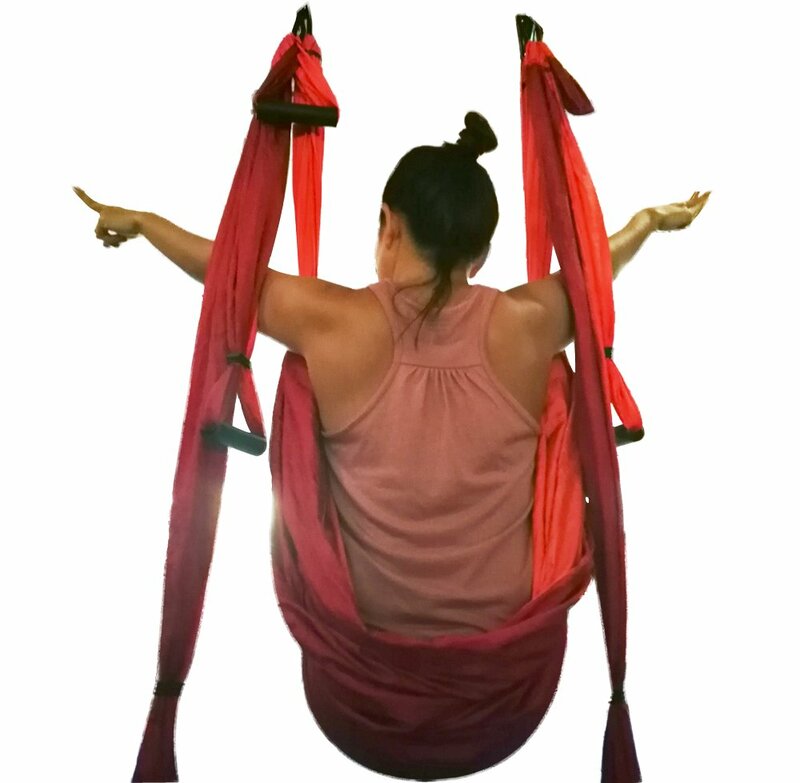 It is most comfortable to practice in the Trapeze with a well fitted, round/crew neck shirt or top paired with yoga pants/leggings or knee length shorts. This adds a layer of protection for your skin so it does not chafe as the fabric rubs against you. Come on an empty stomach! We will be hanging upside down and moving in all sorts of directions as we practice. A full belly will not feel good at all. Wait for the teacher before mounting the trapeze, or coming into the poses. Don’t panic! The trapeze is weight tested to hold up to 600 pounds. It can hold you as long as you trust your weight in to it. Listen well to the leg locks your teacher will call out. This will hold you in the trapeze snugly. Do not jump into the trapeze. Jumping causes the sling to swing, and you may miss your seat if you jump. Your teacher will show you how to get on the sling safely. Should there be any problem with your trapeze, please inform the teacher immediately. Please inform the teacher regarding any medical concerns or health issues you have BEFORE entering the room. This will give them a chance to inform you about your practice better. Avoid eating 3 - 4 hours before class. Arrive early before class starts. If you book online but are not in the studio 15 minutes before class, your slot may be released to waitlisted students. Please contact us if you are already on your way and need us to hold the spot for you. First-timers who are late will not be allowed entry to the class. First-timers are required to attend the first-timer orientation as the Trapeze Class is more technical, involves equipment use, and has safety precautions. Our grace period for regular students joining the Trapeze Class is 5 minutes, which is the period for settling in and warming up. After that, we will not allow anyone into the class for safety reasons.